I’ve never spoken publicly about Sophie’s accident before; I’ve always kept it to myself. I don’t think I’ve really recovered from it, actually. It just leaves a black dot in my life. You never get over something like that. Never. It haunts me to this day; it absolutely haunts me. “It” is an accident that occurred in 1995, one that Garry Pascoe had refused to talk about until the release of the biography of swimming giant, Sophie Pascoe in 2013. What had been known was that Garry accidentally ran a power lawn mower over her 2-year-old daughter, and as a result, Sophie had to have her left leg amputated below the knee. To the credit of the Pascoes, Sophie took charge of her life. Amazingly, she claims in this article from The Telegraph that the accident was “the best thing that ever happened to me”. That is very hard to believe, but it is also hard to argue with her results. At the age of 7, she learned how to swim, and has never looked back. 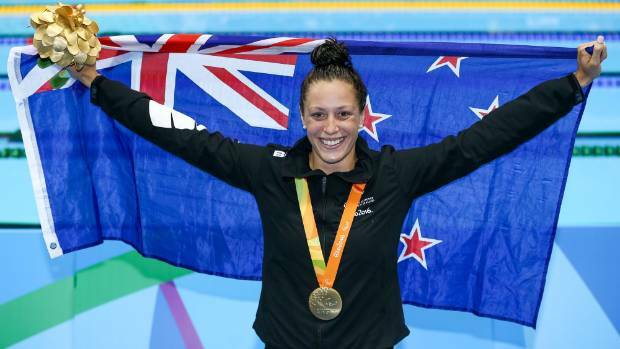 Eight years later, Sophie Pascoe of Christchurch New Zealand won three gold medals at the 2008 Beijing Paralympic Games. By the time she turned 23, she was a veteran Paralympian, having won a total of 15 medals over the past three Paralympic cycles, including 9 golds. Pascoe’s father, Garry, quite understandably, had not publicly discussed the accident. But when Sophie’s biography, Sophie Pascoe – Stroke of Fate, came out, so too did the state of mind of her father on that horrible day of September 23, 1995. Here’s an excerpt from the book published in a New Zealand paper, The Press. I was mowing the raised section of lawn and was in low gear because the surface was a wee bit bumpy. Blow me dead, I went to go in reverse and the mower wouldn’t move. I thought what the s… has happened?’ I looked down and there was Sophie under the mower. It devastates me to think about it even now. I picked Sophie up and ran next door to the nearest neighbours. But they couldn’t help so I ran to Alistair Bull’s place. We got into his car and shot straight through Halswell up Lincoln Road towards the hospital. Sophie’s father goes on to relate in the excerpt some rather uncomfortable details. Only two years old at the time, Sophie made it through six hours of surgery. And while she has gone on to tremendous achievements as a swimmer, he cannot erase the memory of that day. Her swimming success has taken a lot of the pain away. But it will never take away the memory. You just live with it. It’s a big hurdle to live with but I have. Posted in Paralympics, Rio Olympics, Swimming and tagged accident, Garry Pascoe, lawn mower, New Zealand, Rio Paralympics, Sophie Pascoe. Bookmark the permalink.